Hundreds of Zimbabwean lawyers marched to demand justice for people detained in jail and others facing fast-track trials. Lawyers of the Law Society of Zimbabwe bar association take part in a “March for Justice” toward the Constitutional Court in Harare. 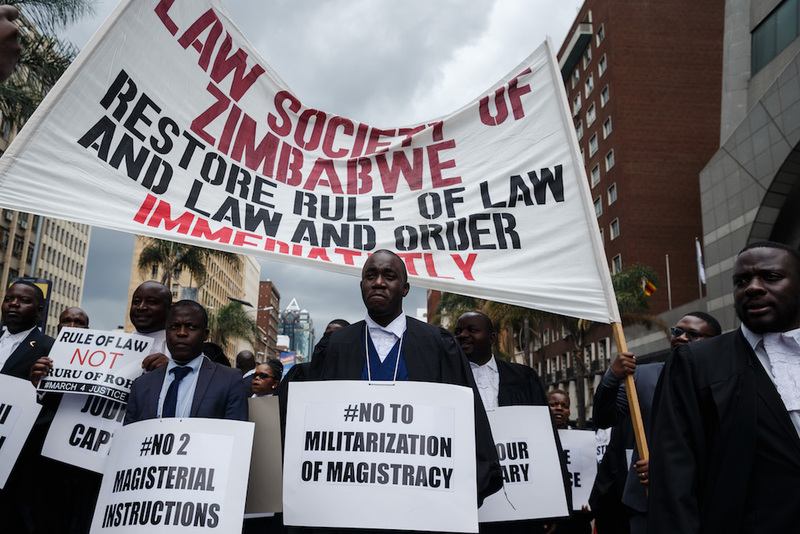 HARARE – Hundreds of Zimbabwean lawyers marched on Tuesday to demand justice for people detained in jail and others facing fast-track trials after violent protests this month led to mass arrests and a brutal security crackdown. Police say more than 1,000 people have been arrested since January 14, when a three-day stay-at-home strike called after President Emmerson Mnangagwa raised fuel prices led to street violence and looting. Those charged have been denied bail in a pattern lawyers say is a violation of their rights. Pressure group Zimbabwe Lawyers for Human rights (ZLHR) says the arrests and detentions, most for public order offences, have exceeded the legal system’s capacity. Lawyers have been unable to extend representation to several hundred detainees including children. Close to 50 people have been acquitted on charges of public violence while an equal number have been convicted and sentenced to as much as seven years, ZLHR said, adding that those found guilty did not have lawyers. Mnangagwa last week pledged to investigate the security crackdown, during which residents and other witnesses say police and soldiers conducted night-time raids on many homes and forcibly removed and beat alleged protesters. On Monday, Mnangagwa said he had ordered the arrest of a soldier and police officer filmed assaulting a man in handcuffs. The opposition has, however, cast doubt on the president’s promises, saying no one has yet been brought to account for the death of six people shot by the military after post-election violence last August. Rights groups say at least 12 people were killed during this month’s unrest while police put the figure at three. The country is also mired in economic crisis, and concerns are growing that frustration over that could lead to more unrest after public workers on Monday issued a 48-hour ultimatum to the government to meet their pay demands or face a strike.